British people, of a weekend, love to get into their tanks and have a big old barney with Johnny Foreigner, celebrating afterwards with a hammock of pork scratchings and a decanter of finest Bovril. 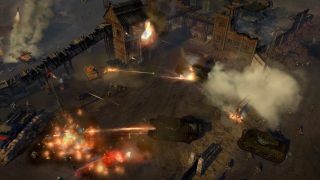 You can now do the first part in Company of Heroes 2 standalone expansion The British Forces, which released on Steam a few days ago. The launch trailer, above, features the UK's biggest Ben, and words emblazoned with the Union Flag—that's how you know it's Britain-themed. The British Forces adds new commanders, units and multiplayer maps, along with supposedly improved motion capture animations, and purportedly characterful troops from across the UK's varied regions. "An international cast of actors from England, Scotland, Ireland, Wales and New-Zealand bring the units to life," Relic sez, "with accents ranging from the posh elite to the working class. The writing of the units’ audio cues was also given special attention in order to ensure the various regional differences – and rivalries – among the British subjects stand out". Tom Senior's time with the game backs that up. "Officers deliver understated warnings in clipped queen's english while infantrymen sit in ditches and go on about wanking." That's...that's all I've ever wanted from a strategy game.